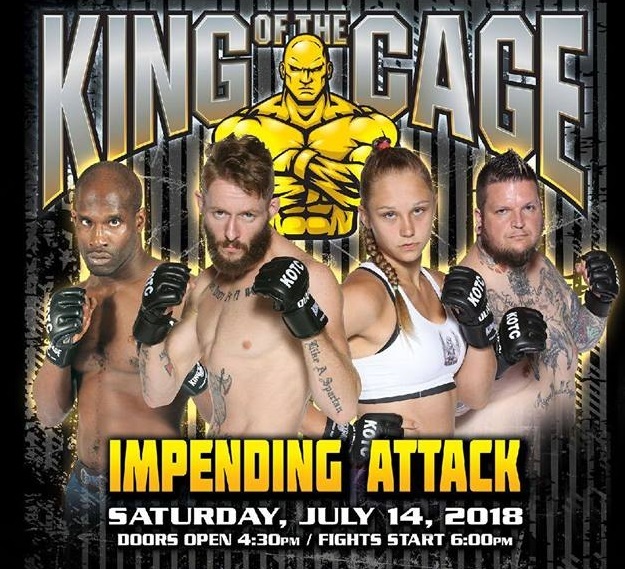 King of the Cage Returns to WinnaVegas Casino Resort on July 14 for "IMPENDING ATTACK"
King of the Cage returns to WinnaVegas Casino Resort in Sloan, Iowa on Saturday, July 14, 2018 with a nationally broadcast event headlined by a Welterweight fight featuring Kyle Angerman vs. Scott Futrell. Other fights on the main card will include John Devall vs. Jay Ellis; Drako Rodriguez vs. Emerka Ifekandu; Melissa Karagianis vs. Katie Saull; Jorge Serrano vs. Shaine Moffit and Chris Galinsky vs. Alan McGrath. Kyle “The Dude” Angerman (4-1) from Des Moines, Iowa (Porcelli’s MMA) vs. Scott “The General” Futrell (8-5) from St. Louis, Missouri (St. Charles MMA). Angerman is top ranked and is looking to avenge his only loss in his last bout. Futrell has won his last three fights. John “Bogus” Devall from Sioux City, Iowa (Devall MMA) vs. Jay Ellis from Milwaukee, Wisconsin (Neutral Ground MMA). DeVall is a former KOTC champion, and both fighters are veteran fighters with 15 wins. Drako “The Great Drakolini” Rodriguez (3-0) from Sioux City, Iowa (One Combat Academy) vs. Emeka Ifekandu (5-1) from Omaha, Nebraska (Disorderly Conduct). Rodriguez has never lost in both his professional and amateur career and is coming off an impressive first-round knockout victory. Rodriguez is also one of the 2016 KOTC World Amateur Championship professional contract winners. Ifekandu is top ranked and has tremendous power. Former Champion, Melissa “Magic” Karagianis from Toronto, Canada (6IX MMA) vs. Katie Saull from Winnipeg, Canada (Winnipeg Academy of Mixed Martial Arts). Jorge “The Saiyan” Serrano from Sioux City, Iowa (One Combat Academy) vs. Shaine “The Spyder” Moffit from Sioux City, Iowa (Independent). Chris “The Super Jew” Galinsky from Sioux City, Iowa (Devall MMA) vs. Alan McGrath from Illinois (Independent). Brandon Sagraves, Solveigh Skarhus, Bradley Love, Ben Clark, Ryan Houston. Doors open at 4:30 pm. and fights start at 6:00 pm. Reserve seating and Ringside tickets available. Next How effective is the Association of Boxing Commissions?